Morocco’s youth-based February 20 Movement called for nationwide protests on Sunday after rejecting constitutional reforms proposed by King Mohammed VI. The king outlined curbs to his wide political powers in an address to the nation on Friday, pledging to build a constitutional monarchy with a democratic parliament. The proposals come in the wake of nationwide pro-reform demonstrations that began on February 20 – hence the name of the movement – inspired by other popular uprisings sweeping the Arab world. “The plan as proposed by the king yesterday does not respond to our demands for a true separation of powers. 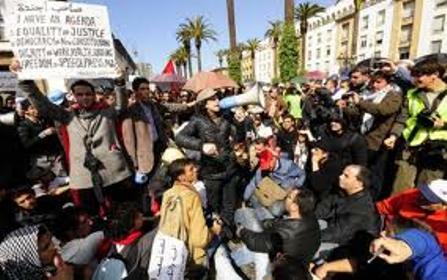 We will protest peacefully on Sunday against this plan,” Najib Chaouki, a member of the movement’s Rabat section told AFP. “The national committees (of the movement) have called for a demonstration for a true democratic constitution and a parliamentary monarchy,” he said. The 47-year-old monarch, who in 1999 took over the Arab world’s longest-serving dynasty, currently holds virtually all power in the Muslim north African country, and he is also its top religious authority as the Commander of the Faithful. Under the new draft constitution, the king will retain this religious role and remain as head of state. He would also remain head of the army and still appoint ambassadors and diplomats, while retaining the right to name top officials of unspecified “strategic” administrations. The prime minister, now to be called the “president of the government” will have the power to dissolve parliament however, which was hitherto the monarch’s prerogative. King Mohammed VI also pledged an independent judiciary and said the prime minister will be able to appoint government officials, including in the public administration and state enterprises, taking over an authority previously held only by the king. Many political players welcomed Mohammed VI’s proposals. That speech was the king’s first since the uprisings that toppled the autocratic rulers of Tunisia and Egypt and came less than a month after the protests erupted in Morocco for more social justice and limits on royal powers. “But is this advance enough? That is what we will discuss today” within the Justice and Development Party, an Islamist opposition party, Othmani said. The head of the government coalition partner Party of Progress and Socialism, Nabil Benabdallah, also praised the speech. “Morocco is entering a new constitutional phase. This plan will allow the construction of a modern democratic state,” he said. But the February 20 Movement, demanding deep political reforms, called for a peaceful protest on Sunday in cities including Rabat, Casablanca, Tangiers, Marrakesh and Fez, according to the movement’s Facebook page, which has more than 60,000 adherents. The youth-led group has brought thousands of people on to the streets in unprecedented calls for change and an end to corruption.